What is a Camera Obscura? The earliest mention of the camera obscura principle was by the Chinese philosopher Mo-Ti in the fifth century BC. Aristotle referred to them, and Leonardo da Vinci gave two clear descriptions of them in 1490. They work on the simple principle of light entering a dark room via a small aperture and images of what is outside are projected onto the opposite wall. This is very much in the same way that a camera works. By adding a mirror that tilts the actual picture that is projected, it can be directed elsewhere such as onto a white table top. 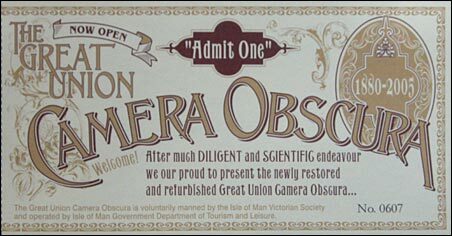 Camera obscuras became very popular in Victorian times and were to be found in seaside resorts around Britain. Their workings were so simple yet they provided a great fascination to thousands each year. There was a camera obscura at Port Soderick and another in the Victoria Gardens, Strathallan Road, Onchan, perched on the cliff top above the Derby Castle dance hall. In Douglas, Mr Hicks obtained permission from Douglas Town Commissioners in May 1887 to erect one on Douglas Head. It was a model as seen at the Liverpool and Manchester Exhibition and was quickly erected alongside the toboggan slide in a group of amusements near to the hotel. Mr Hicks actually lived in his obscura even though it wasn’t very big and not at all suitable. In October of that year he went out one night leaving an oil lamp burning. When he returned the whole structure was ablaze. When it was rebuilt the location changed and it would appear that it was on a plateau just above the landward end of the Battery Pier. Just a couple of years later J R Fielding from Rochdale applied to enlarge the structure but that did not go ahead. In 1891 he invented and patented a 12 lens camera obscura. This was quite different to all the other cameras which only had a single lens on the roof that could be rotated. As a result part of the picture on the table below was always upside down to some of the audience. In March 1892 Mr Fielding applied to the Town Commissioners to build a new 12 lens camera obscura and not only was permission granted but the rent of the plot in a more elevated position for this larger structure was to be exactly the same. The twelve lenses projected down onto 12 separate tables and the name Great Union relates to the coming together of these pictures. At some point in time the number of lenses was reduced to 11 due to internal alterations to the structure. In 1907 he sold the obscura to Mr Heaton who also hailed from Rochdale and it remained in the Heaton family until around 1990 when it passed to the Manx Government. It was restored by the Department of Local Government and the Environment and on 29 April 2005 it was officially handed over to the Department of Tourism and Leisure. The obscura is currently operated by volunteers from the Isle of Man Victorian Society. Other single lens camera obscuras are to be found in Aberystwyth, Bristol, Dumfries, Edinburgh and Llandudno. Some are modern structures such as Aberystwyth of 1985 and some have been added to older buildings. In Bristol the obscura was created in 1829 on top of a 1777 snuff mill, but the Great Union Camera Obscura in Douglas with its 11 lenses is unique.